When you obtain a reverse mortgage, your lender should furnish you with – among other things – an amortization schedule, which is basically a table/graph of how the loan balance will change over time. 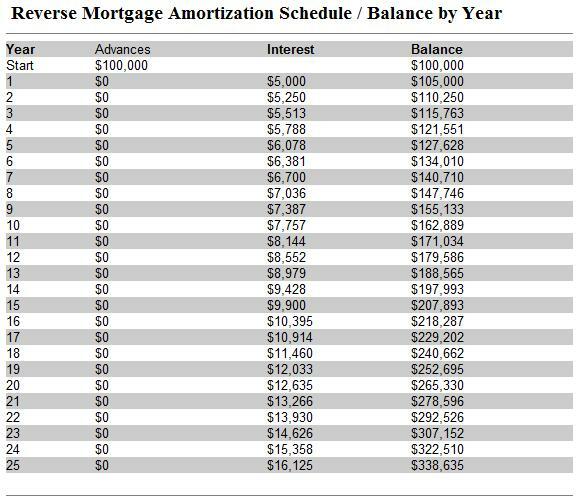 The amortization schedule for a reverse mortgage is unique because it is a negatively-amortizing loan. Since it is repaid all at one time only and (usually) only when the last primary borrower passes away, the loan balance for a reverse mortgage will increase over time. This contrasts with a conventional mortgage, the loan balance of which should decrease evenly over time and eventually disappear as a result of making monthly payments. The best way to conceptualize this is to create a hypothetical amortization schedule even before you begin the process of shopping for a reverse mortgage. Using our reverse mortgage calculator, you can clearly see how your loan balance will increase (as interest and principal compound) until the reverse mortgage is repaid. 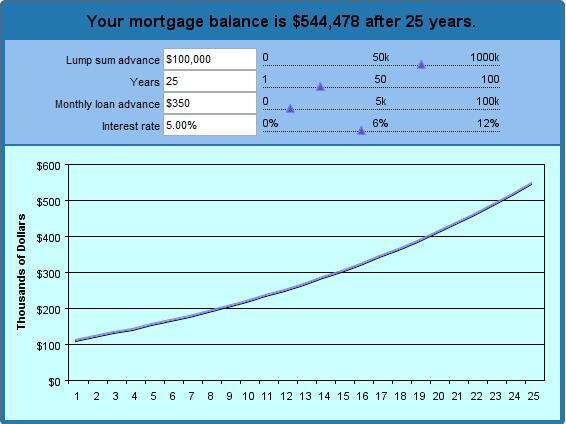 Because you aren’t required to make monthly payments, the loan balance will grow exponentially, to the point that 15 years from now, it will accrue interest twice as fast as the current rate. 25 years from now, it will accrue interest 3 times as fast. In the sample above, I keyed in a lump sum advance of $100,000 and term payments of $350 per month. I assumed an interest rate of 5% and requested a 25-year chart. (In other words, if I obtain a reverse mortgage at the age of 62, when I first become eligible, I can see how much I will owe by the time I am 87. Based on these parameters, the calculator determined that I will receive a total of $190,000 (lump-sum advance + cumulative monthly payments). Over this time, the loan will accrue $325,072 in interest, which means that the lender will be owed $515,072. Wow! While you can adjust the parameters as you see fit, you should bear in mind a couple things. First, the actual interest rate (APR) will be even higher when you take into account closing costs and FHA insurance premiums. Second, this insurance protects you from owing more on your reverse mortgage than your home is worth (a real possibility if you stay in your home long enough), which means that the loan balance on an FHA-insured loan is only relevant insofar as you (or your heirs) ultimately intend to keep your house and pay off the reverse mortgage in cash. Wow! Let me get this straight…you get the cash after paying lots of cash for ins. origination fees, etc. The govet is socking it to us again. Reverse Mortgage is only good,not good, but lets aay if it is a necessity to stay in my home..its only good if I dont leave anything to anyone and dont caare what happens when I die. Wow..what a world we live in. If I deposit Rs. 25,00,000 in a bank and draw a fixed amount say Rs. 40,000/pm including a certain amount of interest and principal just like an EMI for loans.The deposit amount of Rs. 25,00,000 gets reduced slowly and finally becomes zero just like the loan taken. For how long this amount will last. This is a model of safety for Voluntary Retirement employees. Thanks for the crystal clear explanation of the reverse mortgage concept and the nice example of the negative amortization. No other web site seems to give such a straightforward view. nice article; when lenders give a quote for a RM, it does not reflect the actual principal and interest being compounded. Some lenders state the available funds on a credit line part of the deal, or “term”, with or without monthly payments and/or lump sum initial payout – the funds not used, will accrue interest over time. Anyone know anything about this? Who needs this? It is a death trap, and designed that way to take advantage of seniors.